The General Secretary [Xi Jinping] in July and the Premier [Li Keqiang] in April each made inspection tours of the Northeast, and also held forums. This shows that Party Central and the State Council attach great importance to the revitalization of the Northeast. Why is it so important? …The Northeast was the first part of our country to be liberated, and it also has the best industrial base. During the First Five-Year Plan period when the Soviet Union helped build 156 projects, 58 of them were in the Northeast, or one-third of the total. This formed a large group of backbone enterprises in resources, energy, equipment manufacturing and national defense. As the “first born” of the People’s Republic, the Northeast made great contributions to building our country’s industrial system and the whole national economy. The comrades here today are perhaps rather young, but if you ask the older generation [they will tell you that] in the 1960s and 1970s, the Northeast produced a lot of equipment, technical information and personnel that supported the development of the mainland. 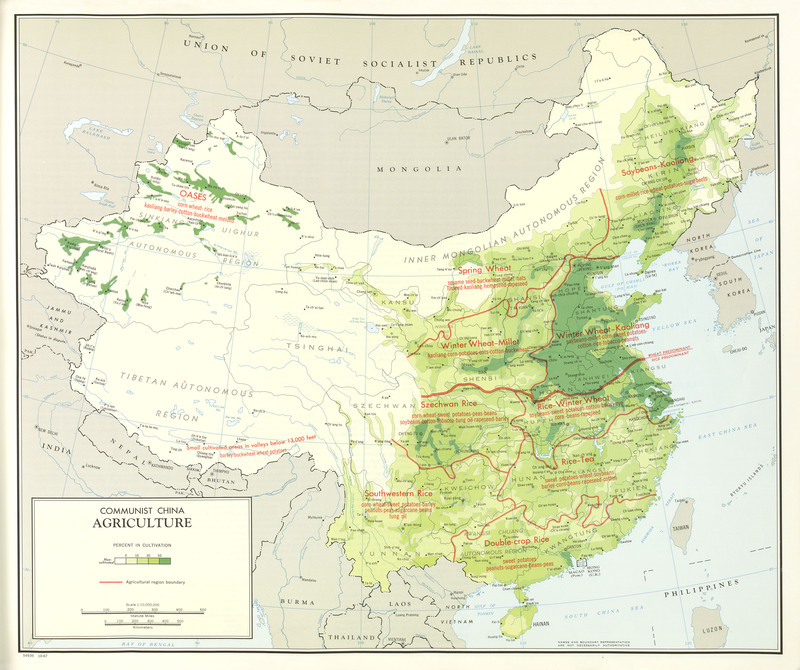 …Also at that time the Northeast made other contributions, producing much oil, grain and timber to support China’s economic construction in the early days after Liberation. It should be said that as the “eldest son” of the People’s Republic, the Northeast has made great contributions, so the People’s Republic will not forget this during the current difficulties. This is the historical perspective. Li’s mention of the Soviet projects in the 1950s piqued my interest–some possible data to work with! It was in fact not too hard to dig up a complete list of the projects, and from that make a few observations (there are a few lists on the internet, but I also confirmed these with printed sources). 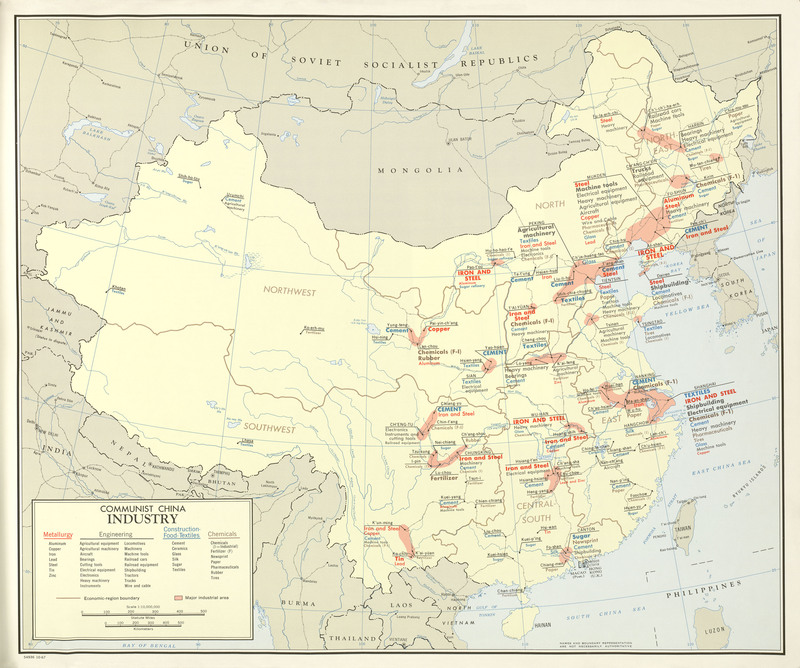 Indeed, the Northeast (aka Manchuria) received the lion’s share of the Soviet projects. These were the flagship projects of the early days of the planned economy, as China worked hand-in-hand with Soviet experts to replicate their model–which at the time, in the afterglow of the Allied victory in WWII, was seen as quite successful. The northern bias of the early planned economy does seems to explain something about China today–anyone who has traveled around the country can attest to the obvious differences between north and south. Try doing a simple “billboard test”: the billboards beside airport highways in the north advertise giant state-owned enterprises; down in Guangdong and Zhejiang, they advertise private firms and trade fairs. The flavor of urban life is also very different, with more small businesses, more variety in domestic brands and more vibrant shopping streets in the south. On the other hand, I haven’t been able to come up with a very strong quantitative relationship. There is a positive but pretty weak correlation between the number of Soviet projects a province had in the 1950s and the size of its state sector today, really nothing to write home about. As my index of the influence of state-owned enterprises shows, the provinces where the state sector dominates most are the giant cities of Beijing and Shanghai, and the more remote western provinces that depend mainly on government projects. While the regional policy of the 1950s focused on channeling resources to the north and the northeast, in more recent decades the west has been the favored recipient–and China in the 1990s had a lot more resources to work with than it did in the 1950s. The Soviet-style planning of the early 1950s laid down one regional pattern, but the Soviet model fell out of favor in the 1960s, and subsequent decades had different priorities. So today’s regional pattern is really an overlay of different influences at different times. So going back to the question I asked at the beginning: do the roots of today’s problems go all the way back to the 1950s? On the data I have now, it would be rash to say that the Northeastern provinces were condemned to have a recession in the 2010s because the Soviets built a lot of factories there in the 1950s. On the other hand, I cannot say that these two facts are completely unrelated. I’m still trying to tease out exactly how they are connected. Appendix. Here’s the complete regional breakdown of the Soviet assistance projects, most of which took place during 1952-60. Manchuria is in bold. ← Previous Post Why are Chinese policymakers so fixated on Japanese toilet seats? Manchuria already had a heavy industrial base due to the Russian, then Japanese infrastructure buildup there. It meant in 1953 PRC was planning with an inherited heavy industrial base and a rail network to service it. Much the same way as US tech firms just ‘happen’ to centre around the infrastructural hub of the Bay Area, planners had a strong base and existing links internally and external links to Russia. Manchuria, and several other inland urban areas were therefore far more industrially advanced in 1953 than much of the southeast coast – there was no coastal-inland divide yet, merely the perennial urban-rural. Southeastern China is naturally plagued by lack of railway infrastructure, it’s industries and trade are sea dependent due to geographic and historical industrial development constraints, plus as you say, initially Sino-Soviet and later China Third Front Industrialisation were centred in inland provinces as defence measures against US attack. Carl Riskin: China’s political economy : the quest for development since 1949. New York: Oxford University Press, 1987. Allen, Robert C. A Reassessment of the Soviet Industrial Revolution, Comparative Economic Studies 47. 2 (Jun 2005): 315-332. Alfred Zauberman, Soviet and Chinese Strategy for Economic Growth. Thanks for the detailed comment. I don’t really agree that in the early 1950s “there was no coastal-inland divide yet, merely the perennial urban-rural.” The three northeastern provinces accounted for about 20% of China’s industrial output in 1952, about the same share as Shanghai all by itself. Guangdong, Fujian, Shandong, Zhejiang and Jiangsu together accounted for another 20%. Beijing, Tianjin and Hebei another 12%. So the economic divide between the coast and the inland was already quite evident, though policy attempted to repress it for a long time before finally giving up and letting the coast go in the 1980s. There were certainly logical reasons for the early planners to try to take advantage of the industrial plant already in Manchuria (though much of it was destroyed or removed by the Soviets at the end of the occupation), but as Naughton points out in the Third Front article you cite, there were not many logical reasons behind the placement of the defense-industry installations in inland provinces. So I would not regard the early 1950s development strategy as simply reflecting regional comparative advantages that were already well established–quite the contrary, the Communists wanted to push back against the pattern inherited from history and craft a new one. Hi, that’s a nice reply. Where are you getting industrial accounts from 1952? Naturally Shanghai was sitting on a huge industrial infrastructure base too. The point really was a heavy industry drive does not make sense in Zhejiang, Fujian, Guangdong, Guangxi when you have no transport to connect them to anything. So I think urban-rural is a better division (includes Shanghai, Xi’an, Beijing-Tianjin) than coastal-inland when you are talking about soviet style heavy industrialisation strategy. Because you are not harnessing the power of sea trade and there was poor transport connectivity internally. And remember the southeast had had a 100 year history of famine, war and local government instability resulting in mass exodus from Fujian and Guangdong. And if you take sea trade out of the equation (communism) then the southeast seems a poor prospect indeed. The real argument there is in a Fel’dman soviet growth model you need an internal agricultural surplus to replicate capitalist colonial inputs. That gives you a good indication of where food surpluses necessary for industrial development were located. That’s basically the urban centres of the North China Plain, the Manchurian corridor, Xi’an, Shanghai delta, Wuhan, Chengdu, Guangzhou. then you’re back to North China Plain and Dongbei, with some support from the Xi’an valley and the Sichuan rice bowl. So Hebei and Dongbei industrial infrastructure investment is logical because of industrial complementarity. Food surplus from Sichuan was a core factor in all Chinese States since the Song because you can float the surplus down the river to feed a non agriculturally productive bureaucracy. Without external capital (friends, slaves or colonies) or internal food surplus (and what pre-industrial society has ever had a food surplus?) then your options rapidly narrow, or in other words you are institutionally constrained to invest in heavy industry pretty much where they did. Third Front indeed went against the institutional constraint, but the Manchurian corridor and Northern Plain were resource determined path dependencies, not planning mistakes or anomalies. It seems what you are saying is that if you wanted to do a Soviet style heavy industrialization drive in the 1950s, then you wouldn’t have done anything differently than what China actually did. Fair enough. But surely the decision to do a Soviet style heavy industrialization drive was not itself a resource determined path dependency, and involved actual human agency. So I don’t see how you can argue that the decision to focus resources on north China was not a consequence of the development strategy; it very much was. I didn’t say the focus on north China was a mistake or an anomaly–I said it was a marked characteristic of the era and the development strategy. To add a more quantitative dimension to the discussion, I took a quick look at the data and there is in fact a positive correlation between the size of a province’s industrial output in the early 1950s and how many Soviet projects it was allocated — to your point that these decisions to some extent reflected the existing industrial structure. The positive correlation is mainly because of Manchuria, which had a lot of industry already and got a lot of Soviet projects. But the correlation is very weak, as a lot of provinces with large industrial sectors got no Soviet projects. Shanghai is the obvious example, as it had the largest concentration of industry in the country. Jiangsu is another: its industrial output in the 1950s was larger than Heilongjiang’s (and has been since then), but it also got nothing. So again, it seems clear that there was a conscious attempt by planners to alter the regional distribution of industry. That’s a great map by the way, thank you.